These photos break my heart. 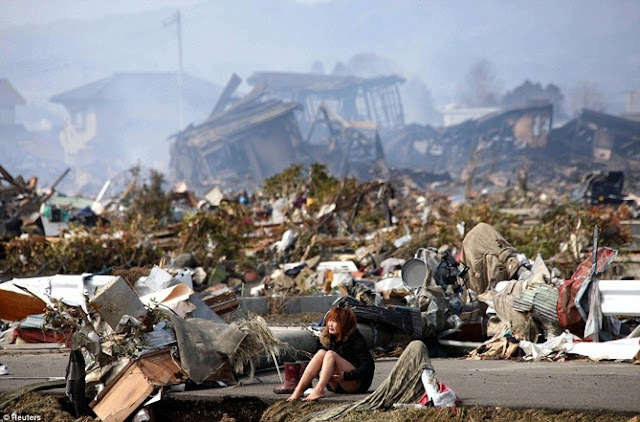 The caption for those above says: Screening: A mother tries to talk to her daughter who had been isolated for signs of radiation after evacuating from the vicinity of Fukushima's nuclear plants (left). She then drops down to talk to the family dog. I can only imagine how wrenching it must be for this mother. When oldest daughter had cancer it was a miracle she did not have to receive a bone marrow transplant and be in isolation for weeks. In my nightmares such isolated misery in the midst of utter devastation depicted below is the fate I always fear for my daughters ever since I have learned about climate change and realized the ecosystem is collapsing - but for these people of Japan it is now already a reality, not an imagined future.